Check out Tobi's Alma Plaid Moto Jacket You're mad about plaid, we get it. 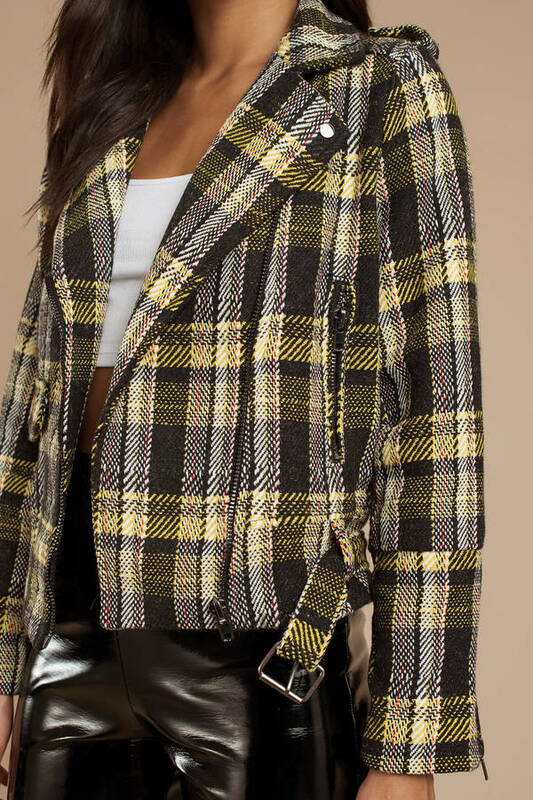 Get Honey Punch's Alma Multi Plaid Moto Jacket to show off the print of the season. This plaid jacket features a large lapel, open front, side zippers, relaxed sleeves, and a belt to keep it all together. Find your fave faux leather pants and pair it with this yellow knit moto jacket. You're mad about plaid, we get it. Get Honey Punch's Alma Multi Plaid Moto Jacket to show off the print of the season. This plaid jacket features a large lapel, open front, side zippers, relaxed sleeves, and a belt to keep it all together. Find your fave faux leather pants and pair it with this yellow knit moto jacket.